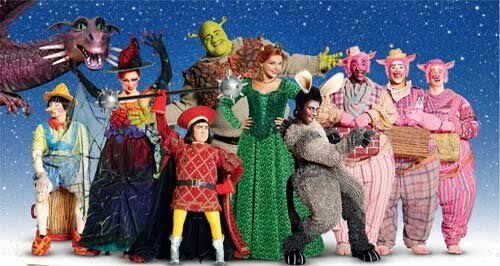 This extravagant musical retelling of the well-known Shrek animated franchise works surprisingly well on stage. The set is magnificent, the costumes sumptuous and the well-known characters bigger than life. The live orchestra and an obvious wealth of talent leant gravitas to a children’s musical studded with farts, belches and innuendo. It was touching, funny and enthralling; eminently suitable for a special night out for the whole family. Shrek, our lovable ogre, played sensitively by Dean Chisnall, melted our hearts with his touching facial expressions that you could clearly see without grabbing for a pair of opera glasses. Princess Fiona, played by Bronte Barbe, had a wonderfully clear voice and strong stage presence, and there was a clever scene in which she and her two younger selves sang in harmony, giving a little Edinburgh girl a chance to shine. Shrek and Princess Fiona were entirely solid as the two leads, but the true comic genius lay in Gerard Carey’s almost Rocky Horror like rendering of Lord Farquaad and the endearingly irritating Donkey, brought to you by Idriss Kargbo. Carey pushed the character about as far as he could, and there were regular explosions of laughter at his ridiculous antics and the pantomime movements of his tiny legs. Kargbo kept a strong sense of the movie character, but made Donkey his own with his dance moves and skilled clowning around with Shrek. There were other minor characters who also made an impression; Pinocchio with his expanding nose and high-pitched nasal voice and the poor tortured Gingerbread Man who was a realistic if slightly annoying puppet! There were a couple of moments when you couldn’t hear the lyrics as clearly as you might, particularly from Shrek, either because the background music was a little loud or the microphone not clear enough, but it didn’t seem to last. Princess Fiona’s voice stood out; a sweet, strong voice, with extremely clear enunciation; fitting for the role of Princess. The dragon’s voice (the young Bermudan Candace Furbert) came as a surprise; rich and powerful, as did the physical representation of the dragon. Big, bold and breathtaking with her sudden entrance, she must have been especially enthralling for children. It was such an evocative retelling of the film, you felt like you were part of this subversive fairy story, and there were a few moments when I wished that I were still about seven years old, rustling loudly through the family bag of toffees and spontaneously dancing in the aisles. There were a couple of slow moments with some ‘filler songs’ in the first half, but perhaps I just have a short attention span, for the children in the audience were spellbound. I enjoyed the pace of the second half better, especially as the motley collection of Fairy Story characters worked together so well, enchanting, humorous and impressive in their choreographed dance routines. There were some amusing references to various decades of the past in some of the big band and Soul numbers, all brilliantly executed. Princess Fiona wowed the crowd as she stripped down to a green sequinned leotard, showing us what she was made of in her spectacular dance routine.